ISO50001 UK is an industry conference which will bring together approximately 300 senior management from UK Business who are considering the transition to this International energy standard, but have yet to make the journey. For full speaker line up and times please Click Here. The theme/profile of this event is simply to create an exchange of information between organisations who are about to make the transition to ISO50001 and companies who have already made the transition. Our speakers have been carefully selected based on their experiences and knowledge of this standard and are keen to network with delegates in an effort to develop the standard further within The United Kingdom. Rajvant Nijjhar is the Director of iVEES®, an international organisation specialising in the independent Measurement and Verification (M&V) of energy efficiency savings www.ivees.co.uk. She is also the President of the UK Chapter of the Association of Energy Engineers (AEE) and a member of the AEE International Certification Board. She has over 16 years of experience in the water, construction, and energy and sustainability industries and is currently involved in the delivery of M&V services for energy performance contracts, the implementation of M&V Plans, independent audit and review of M&V methodology/plans. She is also the UK’s most experienced CMVP trainer, delivering both CMVP and bespoke M&V training courses. Rajvant has trained over 300 people in M&V over the last three years. Professor Andrew Geens is Head of CIBSE Certification, based in London, and is responsible for the operation of personnel and management system certification schemes primarily associated with the energy performance of buildings. Andrew is also an Associate Academic at Cardiff Metropolitan University where he has been supervising a number of PhD projects related to the energy performance of buildings. Andrew was formerly a Principal Lecturer in the Faculty of Advanced Technology at the University of Glamorgan, and he has a BEng (Hons) and a PhD in Environmental Engineering. Andrew is a Chartered Engineer and Fellow of the Chartered Institution of Building Services Engineers and his particular interests in indoor air quality, energy performance of buildings and low energy design of buildings complement his current role perfectly. As Cluster HSE Manager, Chris has 19 sites which he drives continuous improvement for Health, Safety and Environment which has included creating and implementing ISO14001/ISO50001 as part of the Kerry sustainability programme. Chris travels within the UK including Scotland and in Europe including Ireland, Poland, Germany, France and Denmark and will provide our audience with an insight into integration of ISO14001 & ISO50001. Seamus originally trained as an accountant at the University of Limerick, Ireland and began his career with the Playtex Corporation, later moving to Bank of Ireland retail banking division. He subsequently graduated from Oxford with an MBA and changed career to manufacturing, taking up a position with EG&G Sealol Inc. as manager of ceramic grinding. When production was outsourced some years later, Seamus moved to Information Technology, working for Tube Investments Group as IT manager responsible for network and desktop administration. Five years later the John Crane Division of Smiths Group Plc bought Tube Investments and an opportunity arose in Environment Health and Safety. Seamus became EHS Manager for Ireland and in that role has overseen their accreditation to ISO14001, OHSAS18001 and ISO50001. Arriva Rail North (Northern) plays a vital role in the north of England providing 100 million passenger a year. Northern have over 5,200 employees, and deliver more than 2,500 train services every weekday making us the largest train operator outside London. Our trains call at over 500 stations (approximately 20% of all UK stations) of which we manage 476 stations. Northern’s new franchise stared in April and will undergo a £1 billion transformation over the next 9 years with new trains, enhanced stations and more journeys. Gareth is the Energy and Environment Manager for Northern and heads up the environment team and employed to create and oversee the environmental strategy. Northern have won awards for their sustainability excellence at the 2014 north of England excellence awards and the 2015 Rail Business Awards. Gareth was highly commended in the Energy Manager of the Year category of the 2015 Environment and Energy awards and again in the Sustainability Executive of the year category in the Business Green Leaders awards. The improved environmental performance of the company is achieved through an extensive corporate wide ISO 14001 and ISO 50001 accredited Environmental Management System. Northern were one of the first companies to be awarded the ISO 50001 accreditation back in 2011 and were the first company in the UK to be awarded accreditation to the updated ISO 14001 standard back in September last year. Gareth is always looking out for new innovation to push performance and has trialled energy saving products such as synchronous boilers with enhanced controls, LED lighting with fully integrated photo and motion sensors, infrared heating and voltage optimisation. Gareth is a member of IEMA and the EI and graduated from the University of Newcastle upon Tyne in 2003 with an MSC in Environmental Engineering. Arriva Rail North (Northern) plays a vital role in the north of England transporting 100 million passengers a year. Northern have over 5,200 employees, and deliver more than 2,500 train services every weekday making us the largest train operator outside London. Our trains call at over 500 stations (approximately 20% of all UK stations) of which we manage 476 stations. Northern’s new franchise stared in April and will undergo a £1 billion transformation over the next 9 years with new trains, enhanced stations and more journeys. Kyle works for Northern as their Environmental Assurance Manager. Kyle is responsible for the development of the Environmental and Energy Management System certified to ISO 14001 and ISO 50001. Northern has recently been one of the first organisations certified to the new ISO 14001: 2015. The success behind Northern’s Environmental and Energy Management system was reached through effective engagement in all areas of the business and integration with business as usual, day to day processes. Kyle graduated from the University of Salford in 2012 with a First Class Degree in Environmental Management. Mark is an Account Director at the Carbon Trust working with FTSE 500 clients in the Utility, ICT and Transport Sectors – helping them to reduce their carbon footprint, cut energy costs and gain a strategic competitive advantage. Much of this work involves helping companies identify the business case for putting sustainability at the heart of an organisation and demonstrating how this delivers shareholder value. His experience has been built up through 15 years working in Energy Efficiency working for both early stage companies and Global Corporates. In his previous career Mark worked for 3 years at Johnson Controls where he was a founder member of the management team for the European Energy Solutions business helping to build the team to 90+ people across Europe and also in management roles for early stage UK based start-ups in the Energy/Cleantech sector. John has significant international strategic asset management experience across several highly regulated industries managing property portfolios and facilities management with a key focus on delivering resource management and innovative asset programmes that improve efficiency and effectiveness while minimising risk. John has utilised ISO 50001 to in delivering millions of savings through effective energy management. As part of several international development committee’s including the technical committee developing ISO 50001 and additional energy management standards, John is currently involved in a challenging national energy efficiency project to supporting one of Ireland’s largest energy users. Donal has worked in the electrical / construction industry for the over 20 years. In that time Donal has gained vast experience both here and the UK in a wide number of areas from green field construction sites and electrical energy up grades. In all, Donal has over seen the completion of projects valued at more than €200 million. Reduce Energy Costs – DCS Group commit to enable their customers to reduce their energy costs and generate revenue opportunities through strategic management of their energy and continual development of best available technology. 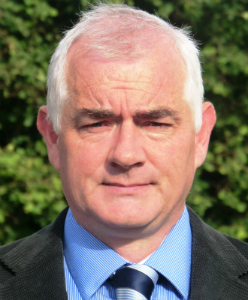 Clive Derham is Facilities Manager and a serving Police Officer with An Garda Síochána,( Irish Police Service ) based at national Headquarters, Phoenix Park, Dublin. Originally, a military garrison, Garda Headquarters is a Victorian Heritage stone Complex, dating from 1850, The Complex is operational, 24×7 hrs with 365 operations, housing Architecture, that supports national Security and Information Systems, The Complex is challenging, in housing many key components of National State Security in one physical strategic location. Clive fulfils a multi discipline role with which demands fastracking solutions in a challenging environment. With a national reach, AGS Energy commitments and potential environmental impacts are as diverse as they are challenging, ranging from operational policing to fleet transport, aircraft to water transport services. These Drivers has provided a platform for the selection of Garda HQ for successful phased Implementation of international best practice Energy Management system (ISO 500001).The implementation of ISO 50001 will assist Garda HQ initially, and secondly, in other significant Police energy use, high spend, centres to achieving best practice energy management and internationally recognized excellence. An Garda Síochána is one the first Police Forces in the world to achieve the ISO 500001 standard. Clive was educated at University College Dublin, holds other third level & fourth level qualifications and is a certified member of BIFM. Emily Chapple is part of CBRE’s Global Workspace Services Energy & Sustainability team. She is assisting a number clients to address the challenges of energy and sustainability management and reporting, as well as adherence with various international compliance schemes (ESOS Lead Assessor, SEAI Registered Auditor). Emily has delivery responsibility for EMEA client energy transition and operational methodologies incorporating the appropriate energy and environmental data reporting and analysis solution. Emily has assisted clients with the development of a range of management systems (50001, 14001, 18001, 9001, 22301) including full system development, gap analysis, auditing and implementation support. To reserve your delegate seat at ISO50001 UK simply email Alan Carolan indicating same and confirmation will be forwarded to you without delay. Iso50001 UK is organised by BoxMedia, an Irish company based in the Midlands of Ireland. BoxMedia work within a number of industry sectors including: (Pharma, Food Processing, MedTech, Energy, Renewables, Data Centres, Environment, etc) providing communication platforms within these European industry sectors.